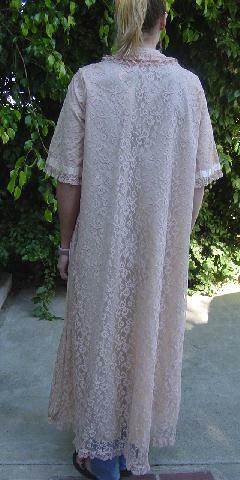 This vintage pale bone-peachy-pink robe is by Odette Barsa and was originally sold at Saks Fifth Avenue. 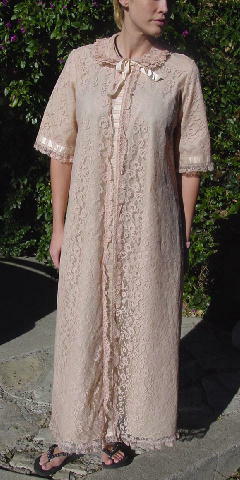 It has a separate (feels like a taffeta-nylon mix) full lining with a lace overlay. There are half sleeves and 3 small snaps down the front. 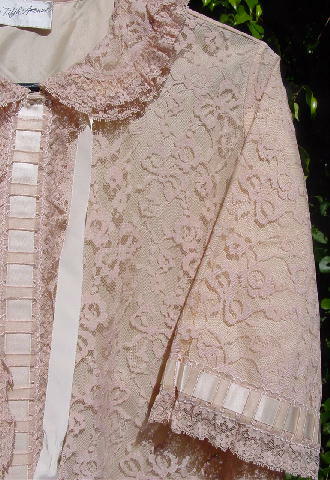 There is a 5/8" wide ribbon which is woven around the sleeves and down the right front side, which has lace running along both sides. It has a double-layered collar with lace around the lower one and a lace panel on the top. There are two ribbons, one on each side of the collar so you can tie them in a bow below the neck. It's from a stylist's inventory, and was worn once, in a movie. shoulder to shoulder 15 3/8"
shoulder to end of sleeve 14"
armpit to armpit 21 1/4"